This beautiful historic home in downtown Carlisle features hardwood floors throughout, a yard with garage, and a large balcony off the master suite. The forced air heat and A/C is gas as well as water heating. Rent includes washer/dryer (in basement), fridge, and stove. There's a half bath on the first floor as well as an office / mudroom off the kitchen. The fireplace is ornamental. Pets subject to approval with references, records, & pet deposit. Contact Dave for more info or showings. Tenant pays all utilities (water/sewer, electric, trash, and gas) and is responsible for lawn care and snow removal. ​This townhouse end unit is in an ideal location for law & army students, walkers, bikers, and anybody who enjoys the downtown life of Carlisle but wants to remain off the "main drag". 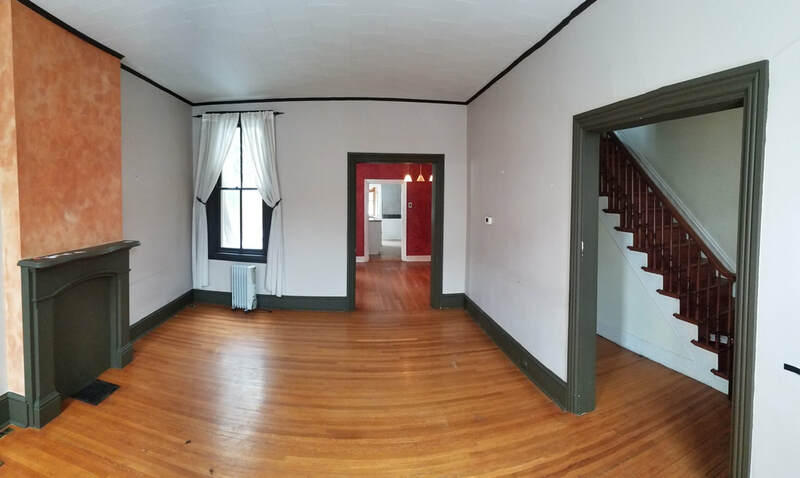 The historic features throughout this rental make it a great find for anybody who appreciates the historic architecture of the area. You can't miss the beautiful hardwood floors that run throughout the first and second floors. The large living room has lots of light as does the rest of the downstairs considering it's a townhouse. There's a first floor half bath, laundry hook-ups (washer/dryer currently in basement), and office space / mudroom overlooking the back yard. The master suite upstairs has plenty of closet space and includes its own private balcony overlooking the yard. Despite the old house, it's updated with forced air A/C and heat. Conveniently located within walking distance of all downtown Carlisle has to offer & both Dickinson Campuses, and a few minutes drive from I-81, The Turnpike (76), and the Army War College. Tenant is responsible for all utilities (gas, water/sewer, trash, & electric) as well as lawn care and snow removal. Pets okay with references, vet records, and pet deposit. Owner is represented by a licensed Realtor in PA #RS300174. All information is deemed reliable but not guaranteed. Contact Dave for showings or more details. 1631sqft townhouse with 3 bedrooms on the second floor. 1 full bathroom with tub on second floor, 1 half bath on first floor between kitchen & study. 1st floor has Dining Room, Living Room, Kitchen, Half Bath, Basement access, and Study/Mudroom. Range, and Fridge included in the kitchen. Central A/C and forced air heat using natural gas. Tenant pays all utilities + responsible for lawn care & snow removal.